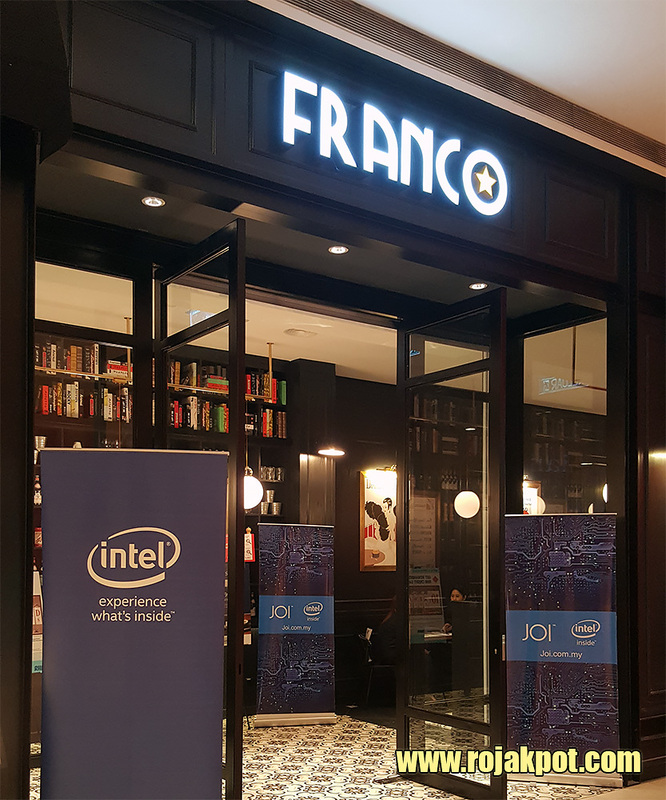 At a recent Intel Malaysia event, we were treated to lunch at Franco, the swank French-Japanese restaurant in Pavilion. 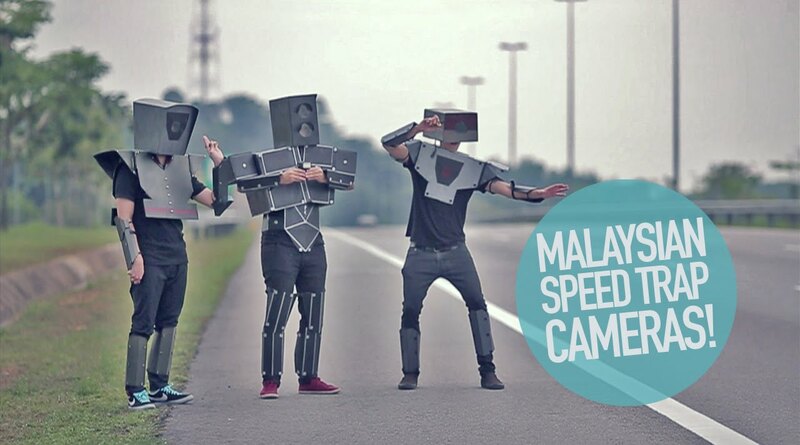 It’s located on the 6th Floor of Pavilion KL, at Lot 6.01.04. You can ask for syrup if your cafe au lait is not sweet enough. Because I was having coffee, I didn’t want to start with something acidic, so I went with the Clam Chowder. It was delightfully creamy but was way too sweet. 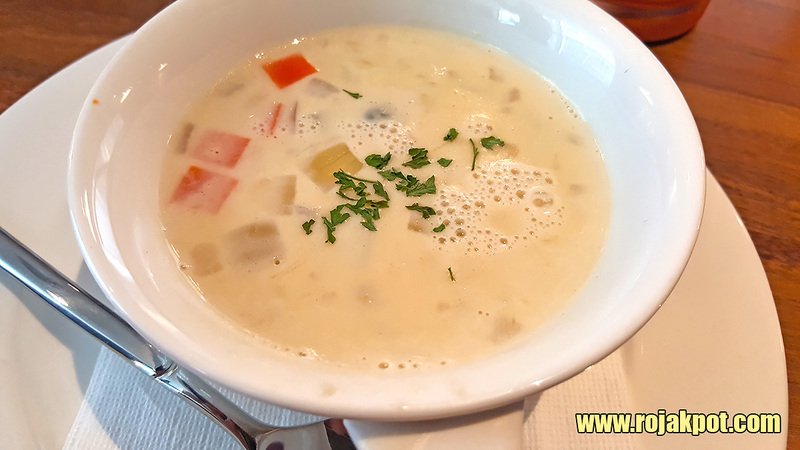 The sweetness overwhelmed the natural savoury flavour of the clam chowder, making it taste like sweet soup. 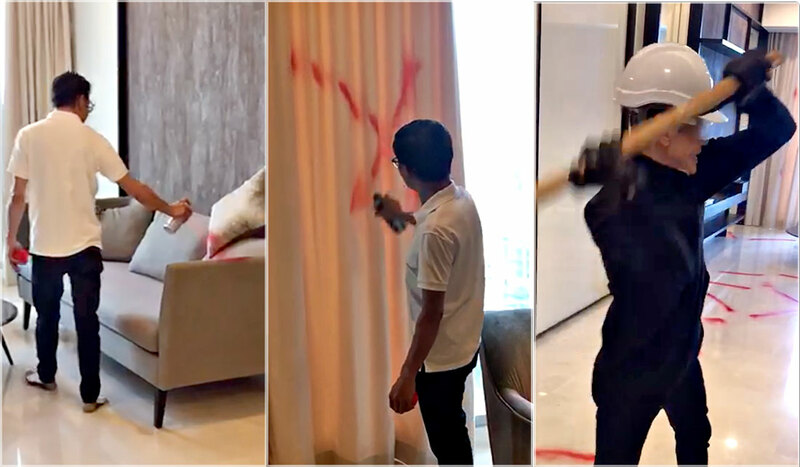 I would rate it 4 out of 10. 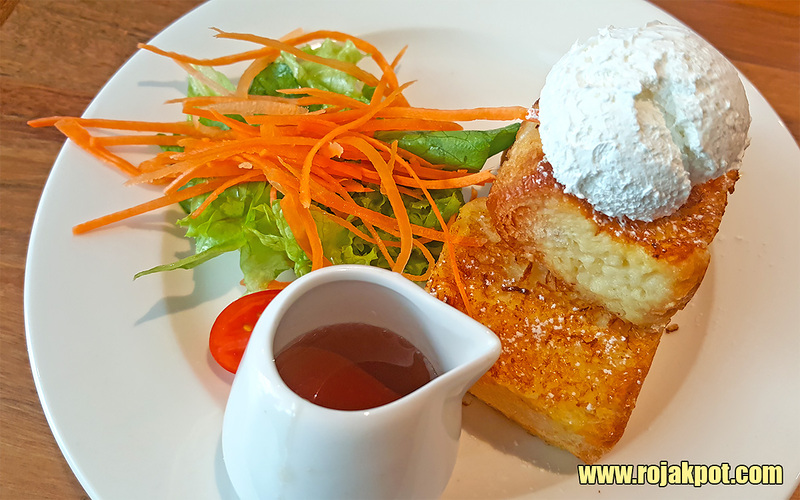 The Petite French Toast consisted of thick chunks of French toast (bread soaked in egg and fried) topped with an indulgent topping of whipped cream.The side salad was served with a vinaigrette dressing. It was a nice interpretation of a common breakfast meal. Overall, it was a 6/10 for me. 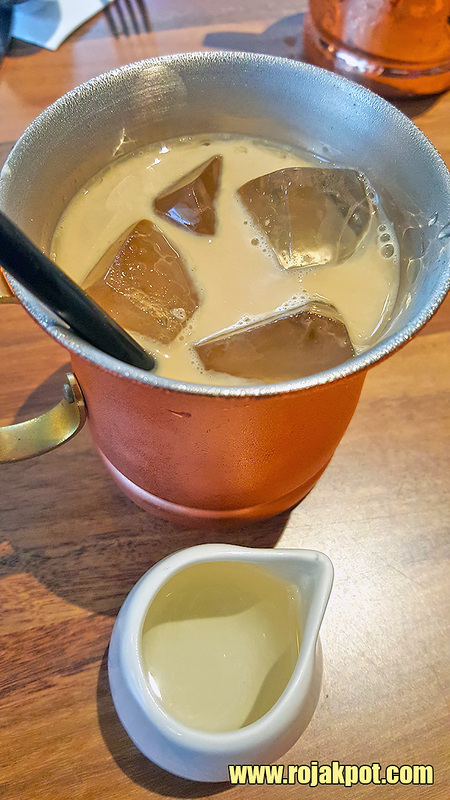 The maple syrup is actually EXTRA. Someone on my table asked for it and they served it to me as well. If you ordering this, you may request for this as a healthier alternative to the whipped cream topping. Frankly speaking, the whipped cream was better, lending a light sweetish mouthfeel to complement the slightly greasy and saltish French toast. There is no need to use all of it. Just spread a thin layer (if you are on a diet) or a thick one (if you are feeling lucky today!). The waiter recommended that I either try to Spaghetti Pascadora or this, the Squid Ink Rice. I decided to go with the Squid Ink Rice because it was a unique dish, and not just another interpretation of another pasta dish. But I also took pictures of two of the pasta selection to share with you guys. 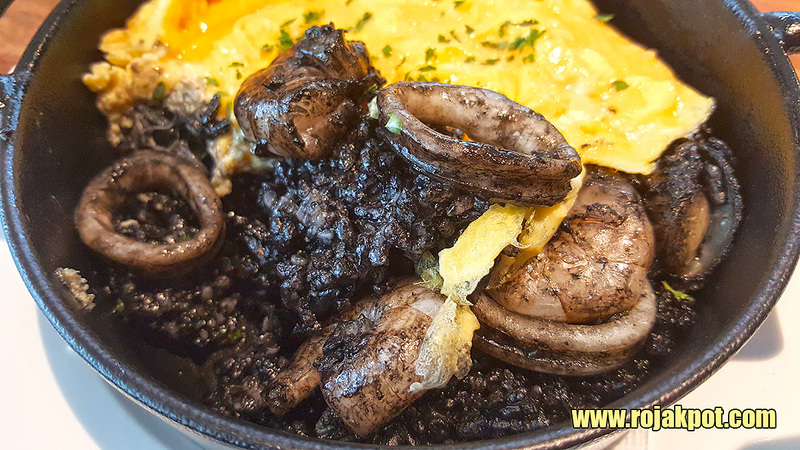 The Squid Ink Rice was served in a unique hot plate, topped with Omu egg (Franco-spiel for omelette). The portion looks small, compared to the pasta main courses, but it’s so rich, it will fill you up. 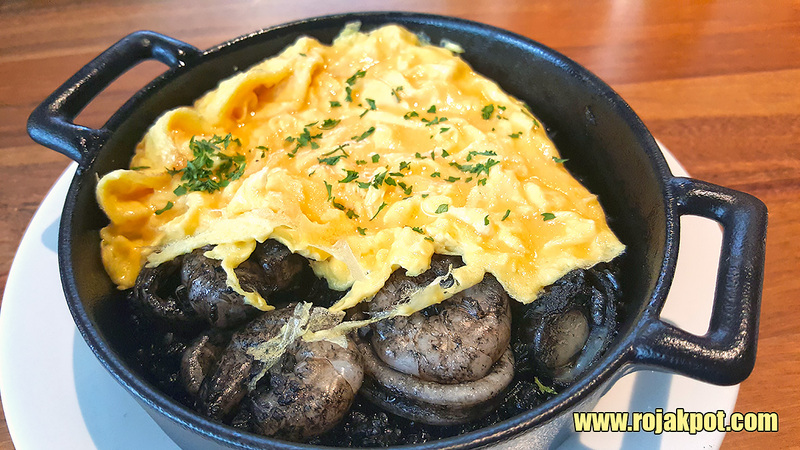 Underneath the Omu egg topping, is a bed of short-grained Japanese rice with prawn chunks and squid slices – all coated in a sticky squid ink sauce. The dish was a tad too greasy, and lacked the savoury umami taste I expected. So while it was filling and unique in its presentation, I would rate it a 5/10. 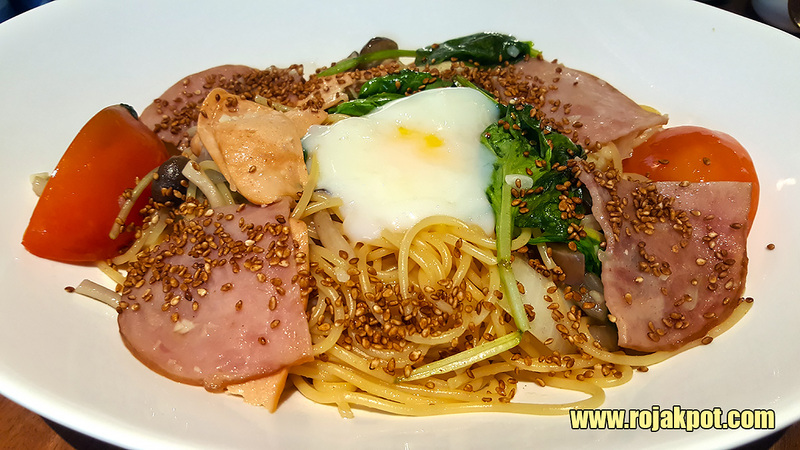 If I didn’t opt for the exotic (Squid Ink Rice), I would have chosen Spaghetti Yumeina, an French-Japanese interpretation of the Italian spaghetti using a shoyu broth base and garnished with “frankfurters, baby spinach, tomatoes & smoked chicken ham”. It certainly looks delicious, and while it doesn’t look that big in this picture, it really is a BIG portion. 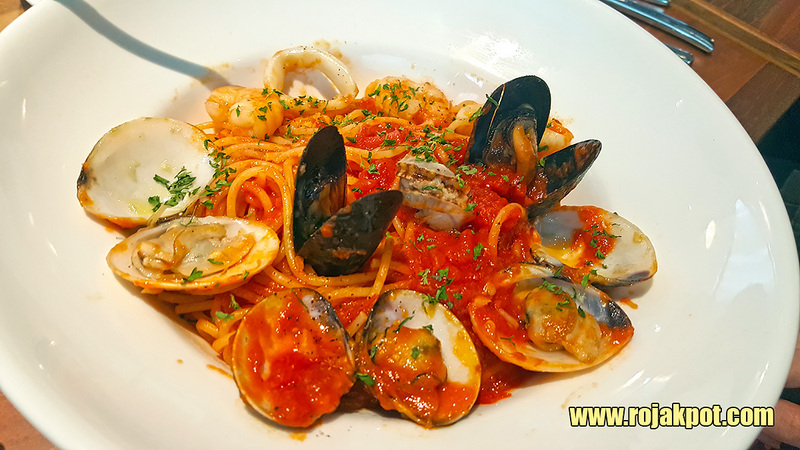 The other option is the seafood marinara spaghetti which they call Spaghetti Pescadora. This is the safe choice if you want something Italian, not some French-Japanese interpretation of a classic Italian dish. The dessert item was either a vanilla (boring!) 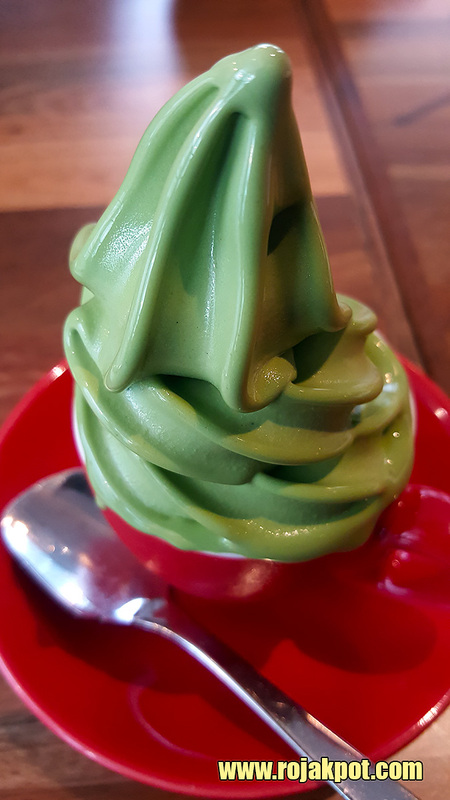 softee, or a matcha (ground green tea) softee. No prizes for guessing which I went with. Seriously, this isn’t even an option. 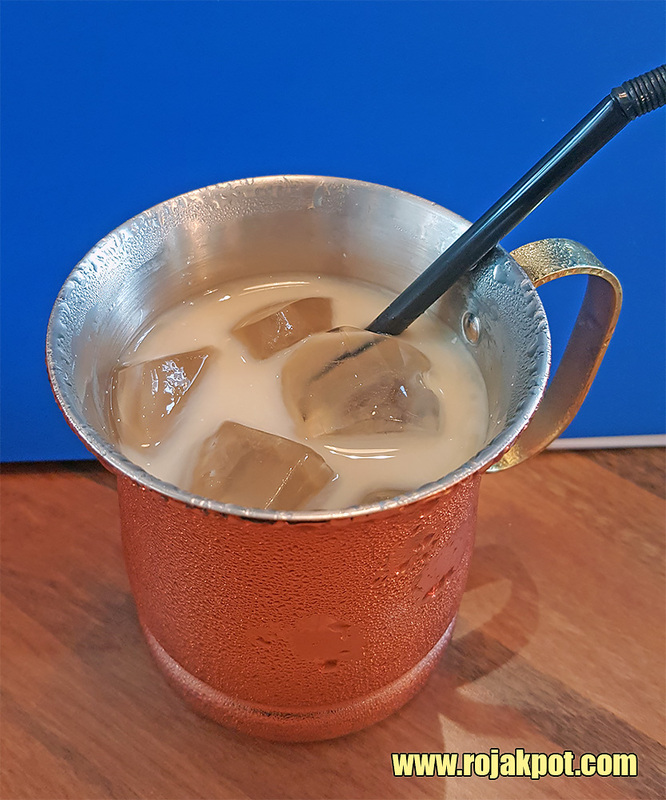 You are in a French-Japanese restaurant, so vanilla is really just the fallback option for those who simply cannot stand the taste of matcha. Everyone else, there is only one choice – the matcha softee. Frankly speaking, it tastes no different from the matcha softee served at a matcha softee vendor (if you can still find one). The presentation is quite unique though – it’s served in an espresso cup. I would rate this a 5/10. Franco is a fast casual restaurant so while the entrance may exude some Old World charm, it was bright, airy and modern inside. That means nothing fancy. That includes the waiters who, as much as they try, are simply not proficient enough to offer proper suggestions or recommendations. It almost felt like eating in a fast food restaurant. Franco’s fusion food concept was quite good though, offering new interpretations of the usual staples of Western and Eastern cuisine – pasta, rice, bread. They also put some genuine effort into the plating presentation, which is a key aspect of fine dining. However, I feel that they need to put more effort into the taste of their dishes. They should delight the palate as much as they delight our senses. If you want familiar and yet different, you are in the right place. For the less adventurous who are forced to tag along, don’t worry – they have safe choices for your limited palates too. 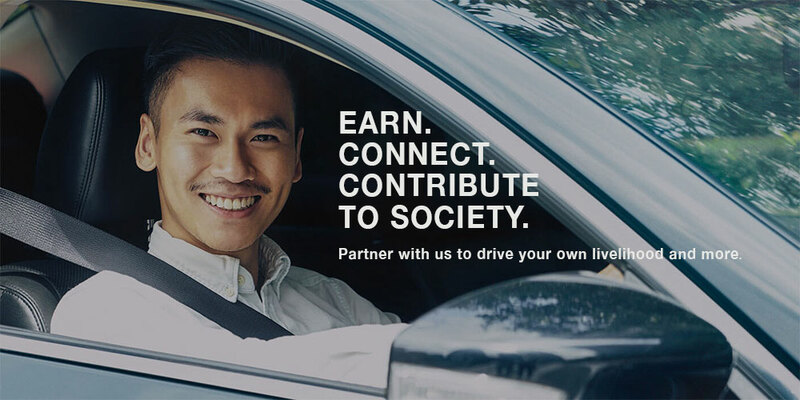 A win-win situation. Oh, in case you are wondering, yes, they have free WiFi at Franco Pavilion and the password is 1234567890. Previous : MamaPride Invents World’s First Modesty Pants For Women! Next : The Top Gear finale is out!